If you have an accident at work claim, our experience pays. If you’ve been injured at work because of defective or incorrect personal protective equipment, or PPE as it’s commonly known, you might have a PPE claim for compensation. According to the law, all employers are required to take all precautions to protect their employees from potential risks in the workplace. These protective measures could range from creating a safe workplace to providing adequate training on how to use the various devices in the workplace and providing appropriate personal protective equipment. The exact safeguards, training and personal protective equipment will depend on the inherent risks in that particular industry. What Does Personal Protective Equipment Include? Personal protective equipment refers to any kind of equipment that is meant for personal protection at any time. While everybody is responsible for buying their own personal protective gear while they are carrying out home DIY for example, when you are working for an employer, it is the employer’s responsibility to provide you with the necessary PPE. 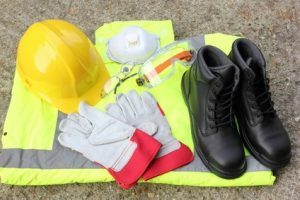 As mentioned earlier, the exact personal protective equipment that an employer needs to provide their employees with will vary from one industry to another depending on the inherent risks in that particular industry. Gloves for protection against cuts, scalds and burns and while lifting sharp, heavy objects. Safety eye goggles for protection against sparks while welding, dust particles from sawing, and general debris while working on building sites and similar workplaces. Safety hard hat to protect the head from bumps and from objects falling from heights. Proper work boots that are appropriate for that particular workplace. Safety harnesses if you are working high off the ground. Stab proof vests if you are part of the police force. Protective masks or respirators for protection against breathing in fine dust particles. Flame retardant coveralls for fire-fighters. High visibility clothing for workers doing the night shift. PPE provided by any employer must meet two important criteria as laid down by the law – it must fit well and it must offer adequate protection. Gloves must fit well and be thick and long enough to offer the hands adequate protection from open flames or sharp objects. Safety eye goggles must fit well without slipping off. Hard hats must fit securely on the head and offer sufficient protection against objects falling from height. Footwear must be the right size and be appropriate for that workplace –for example steel toed boots on building or construction sites. Stab proof vests must fit well and be of the best quality possible. Protective masks must fit well and prevent any dust entering the nasal passage. Flame retardant suits for fire fighters must be of the best quality available. Employers cannot consider personal protective equipment as primary protection. They must first put measures in place to remove all potential risks from the workplace. Personal protective equipment should be to provide individual employees with additional protection. The necessary equipment must be provided by the employer and paid for by the employer. Personal protective equipment is not the employees’ responsibility. The equipment that is provided must be of the right size for the wearer and meet laid down design standards. All employees must receive adequate instructions and training on the right way to use and care for the PPE. If multiple items of PPE need to be used together, all items must be compatible with each other. Regular maintenance checks must be carried out to ensure that the personal protective equipment is not defective or damaged. All PPE must be stored properly to prevent premature damage or deterioration. If an employer fails to meet any of these requirements and you get injured as a result, you may have solid grounds for claiming PPE compensation from your employer. It does not matter whether the employer failed in their duty to provide adequate protection due to ignorance of the law or in an attempt to save money. Whatever the reason for the accident, if you are injured at work due to inadequate personal protection equipment, your employer would be considered negligible and is liable to pay you compensation. Unless you are conversant with the law and have had experience with fighting any case in court, it is always advisable to get professional legal help when you want to file a work accident claim for any type of injuries. Personal injury law is complicated and winning a claim without legal help can be extremely complicated and time consuming. You have to remember that you will be fighting against experienced lawyers who do this every day. Your best chance of winning a PPE compensation claim is by finding an experienced personal injury solicitor to represent you. The process for our experienced in-house solicitors is simple. If you haven’t done so already, contact us for a phone consultation (always free) during which we can listen to your account of the PPE accident and talk through the supporting evidence – photographs, an incident report, witness statement and doctor’s notes. Once we know you have a strong claim, we will go out of our way to help you get the compensation that is due to you for your personal protective equipment claim. We represent the majority of our clients on a No Win No Fee basis, essentially meaning that you pay nothing by way of charges or court fees at any stage while the PPE claim is in progress. You only pay the agreed fee after the court has ruled in your favour, which means you are never out of pocket at any point when making a claim with us. With a dedicated accident at work solicitor representing you, you know your claim is in the best hands possible. Not only do you have a higher chance of winning your PPE claim but it will also give you some much-needed time to rest and recuperate from your injuries instead of dealing with the stress of the case. Call now to speak with us about your personal protective equipment claim, the sooner we get the ball rolling the sooner we can get you your compensation.